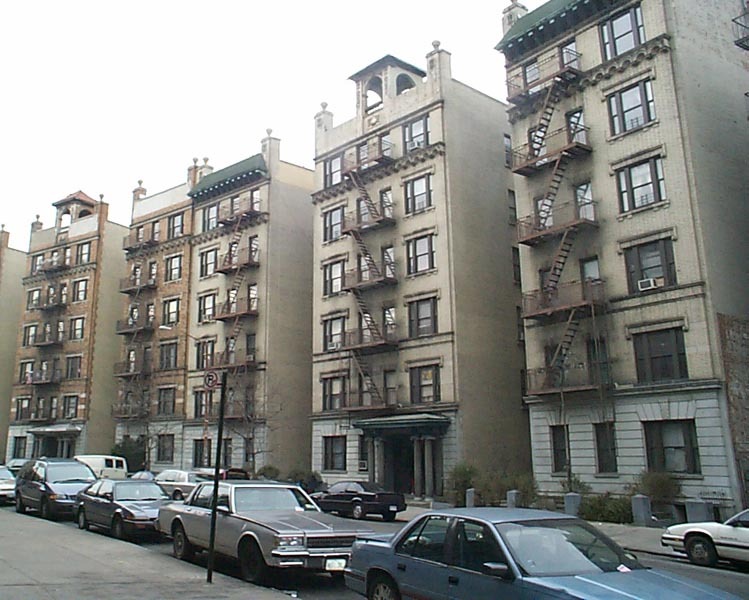 The trip began at Park Place, where Gary and Roseanne Wengeroff, David J. Greenberger, Interborough, KMA, Frank Caliendo, and two others whose names I forget met tour guide Peggy Darlington at 9:00. 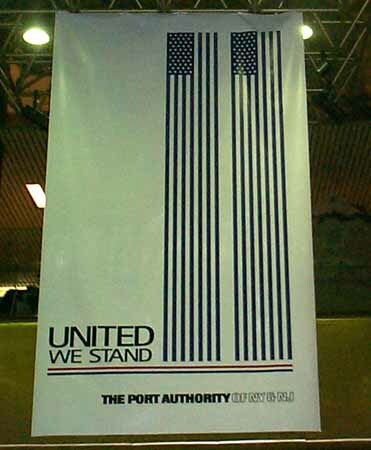 At the WTC complex, the Oculus is mostly hidden by a black sheet over the glass separating it from the paid area; the passage where it resides is closed to the public. 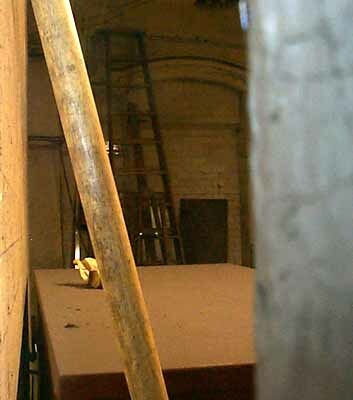 We made a stop on the A/C platform to lean over and observe the wall where the glass doors leading from the E to the shopping concouse once were. 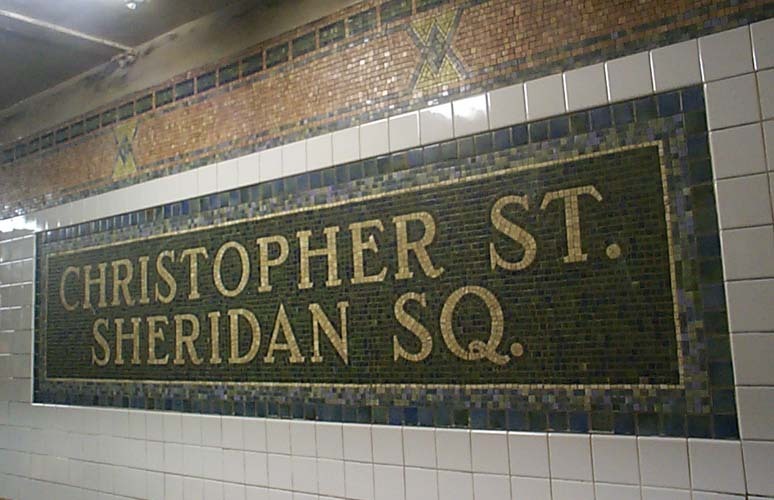 Next stop was Christopher St/Sheridan Sq. 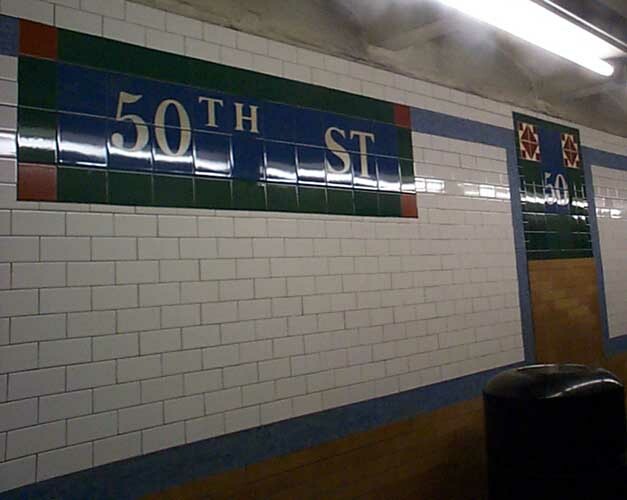 Like most of the stations on the West Side IRT south of Times Square, Christopher St has been recently renovated with a "skin job;" that is, the old white tile has been covered over with new tile, while the original station name tablets and Squire Vickers mosaics have been cleaned. 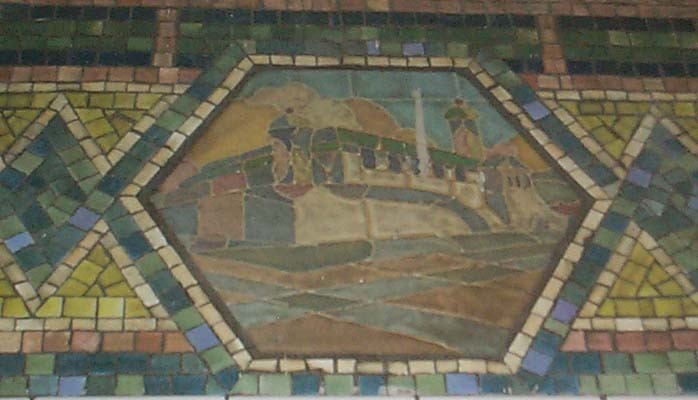 A skin job is easy to identify, because the original tilework is recessed in the new tile. 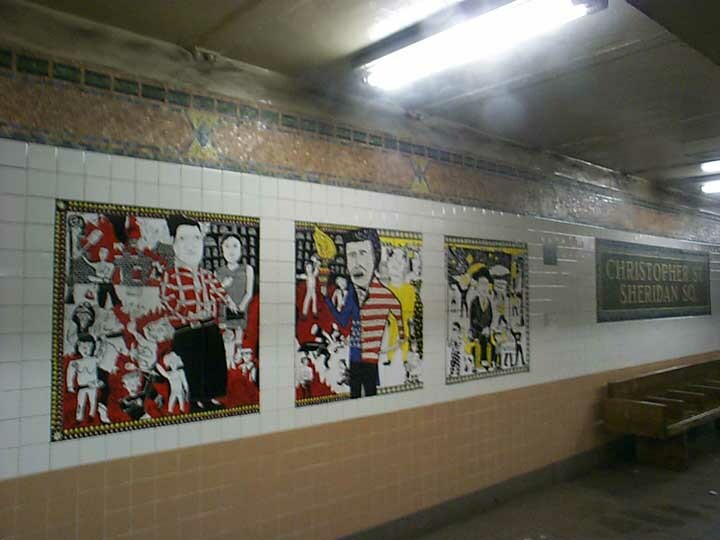 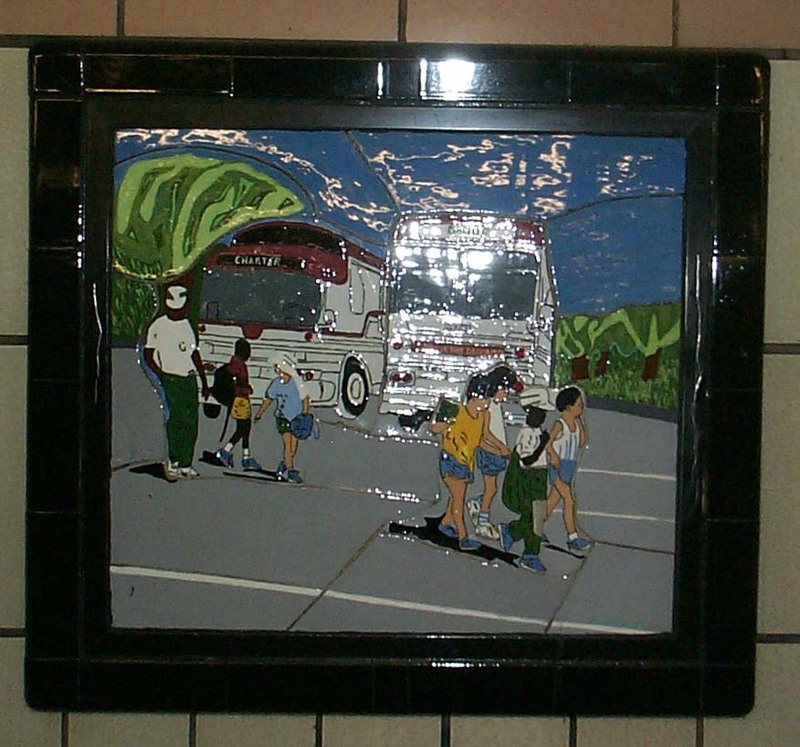 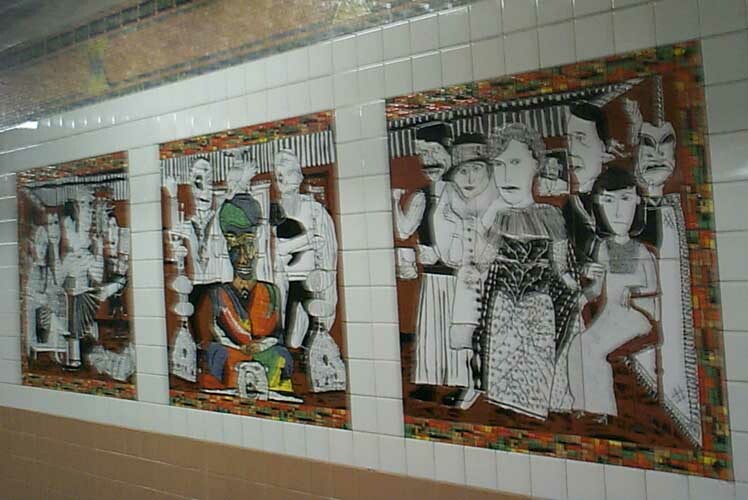 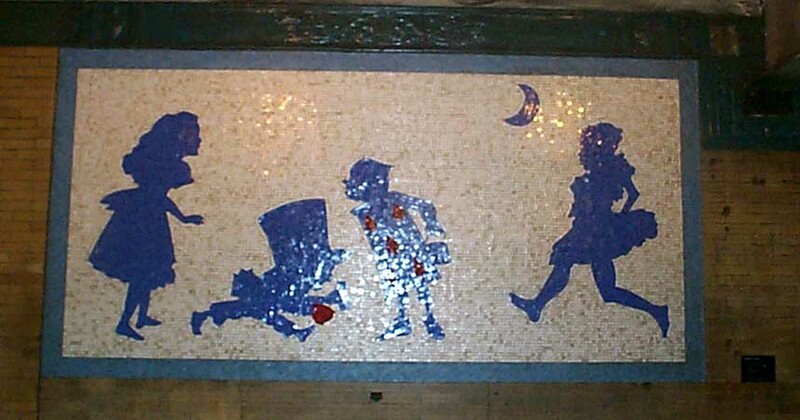 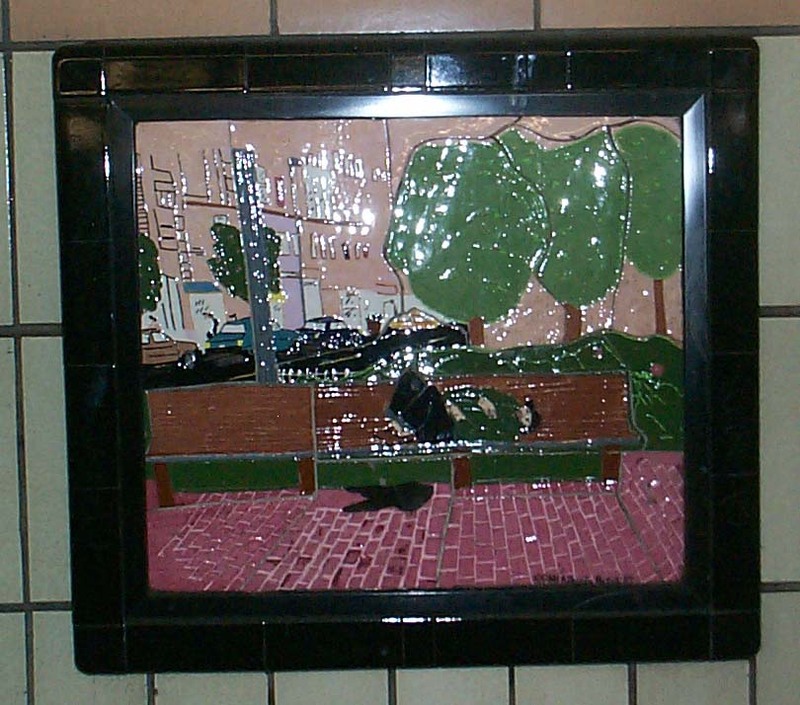 The artwork in this station is titled "The Greenwich Village Murals" and was designed by students at PS 41. 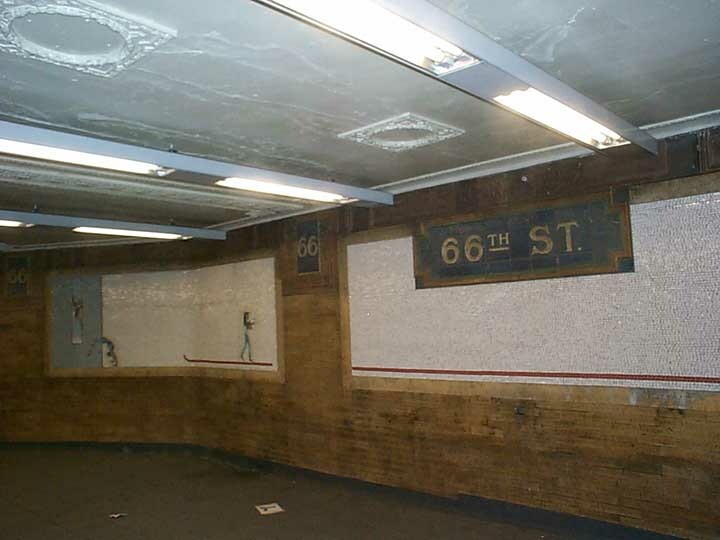 The next noteworthy station is 34 St, although Peggy pointed out a quirk at 23rd: the platform is painted bare concrete, rather than tiled. 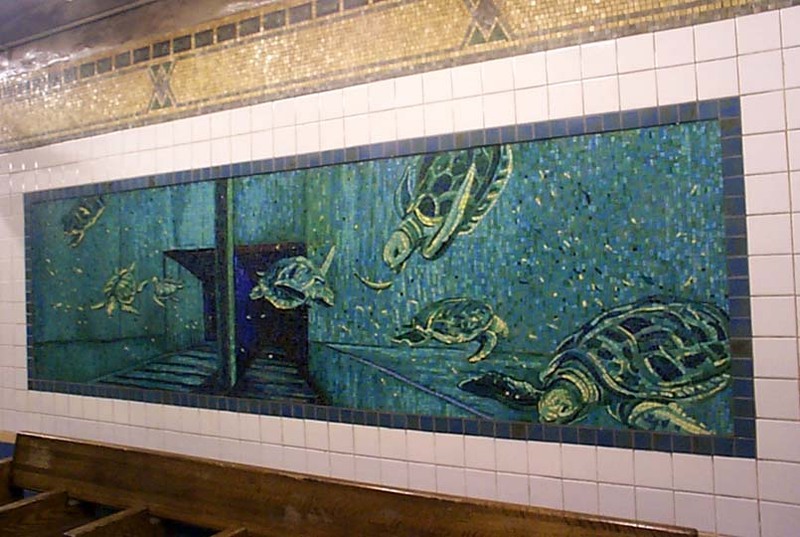 At 34th, we saw the blue plywood wall where Sbarro's "railfan windows" were, a victim of ADA compliance (this is where the platform elevators will be installed), and small ceramic mosaics of animals. 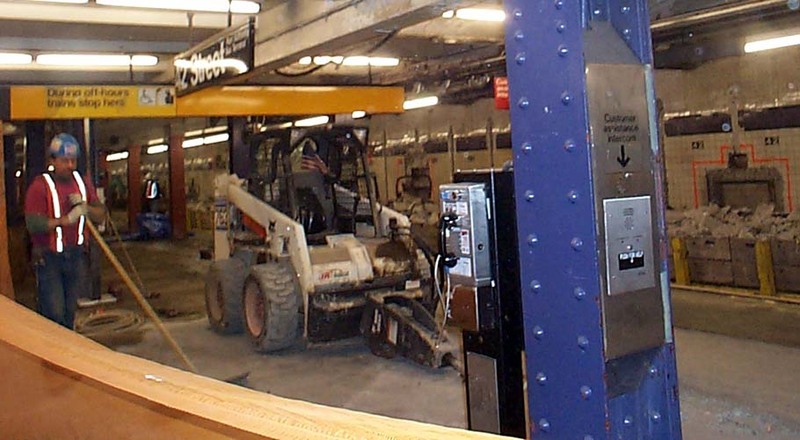 A decent amount of time was spent exploring the renovations at Times Square. 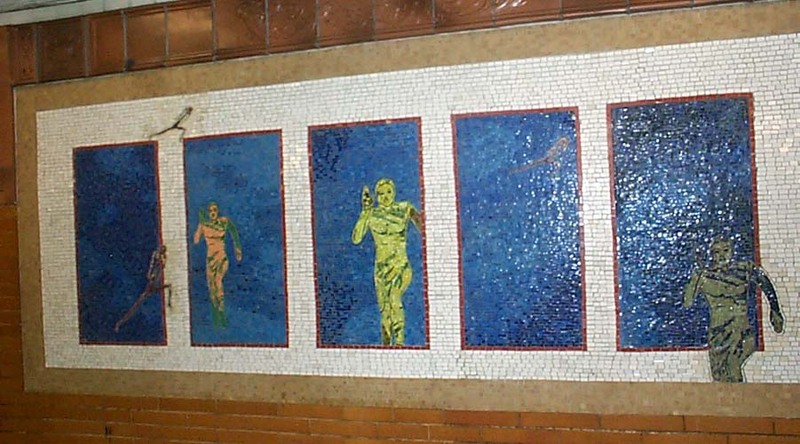 including the mosaic on the IRT mezzanine and the late Jaob Lawrence's New York in Transitover the BMT stairways. 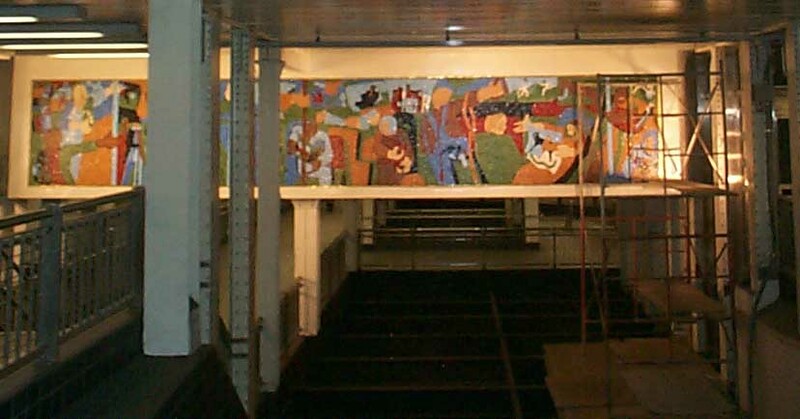 Elevators in the BMT "ellipse" are almost complete. 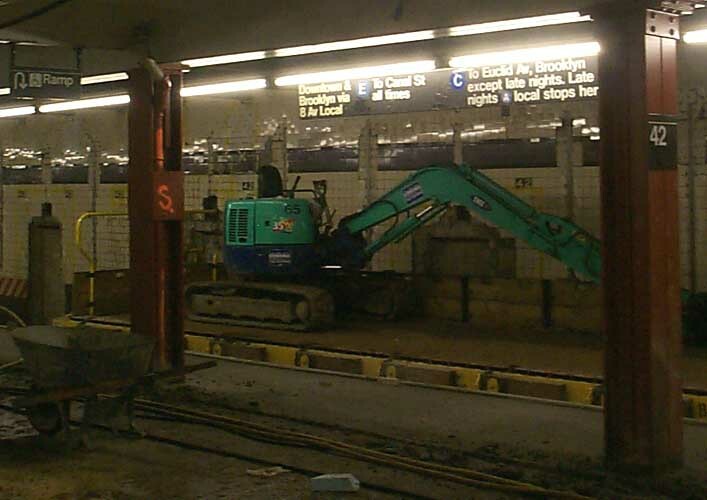 Long-term closure of the main entrance on the south side of 42 St between Broadway and 7 Ave began the morning of our trip. 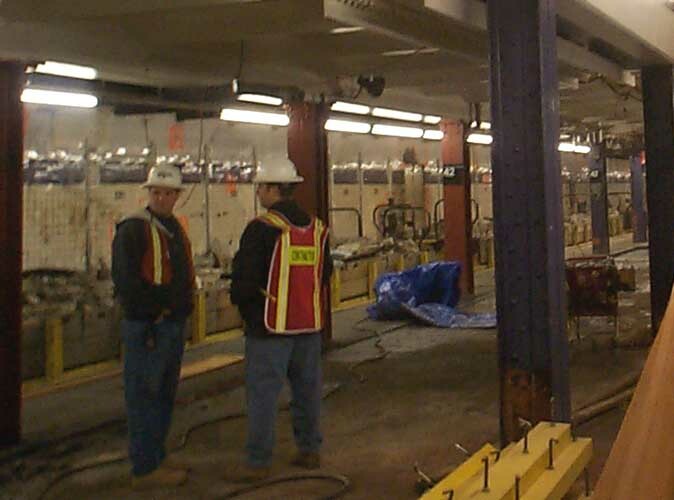 After a quick rest stop in the Port Authority Bus Terminal, we took a look at renovations on the IND platform, where loose tiles were being removed from the walls, and workers were sawcutting the local side of the downtown platform. 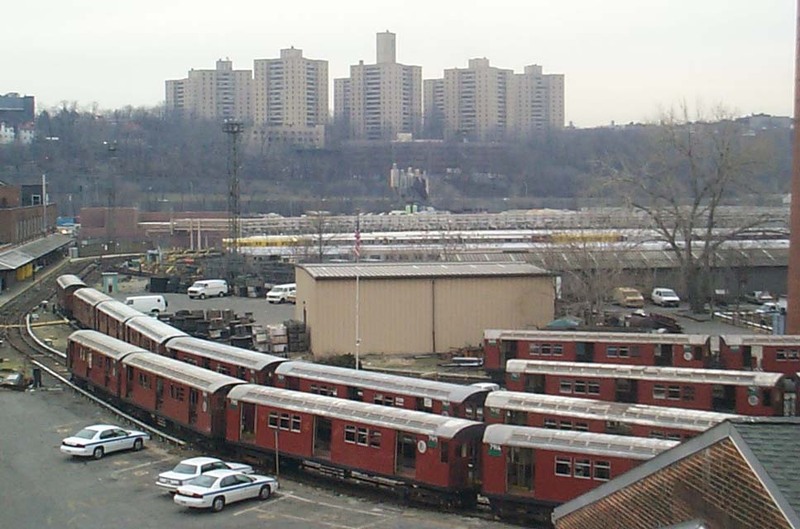 Debris was being loaded onto flatcars parked on the local tracks; the MOW consist was headed by two locos and an R-14 rider car. 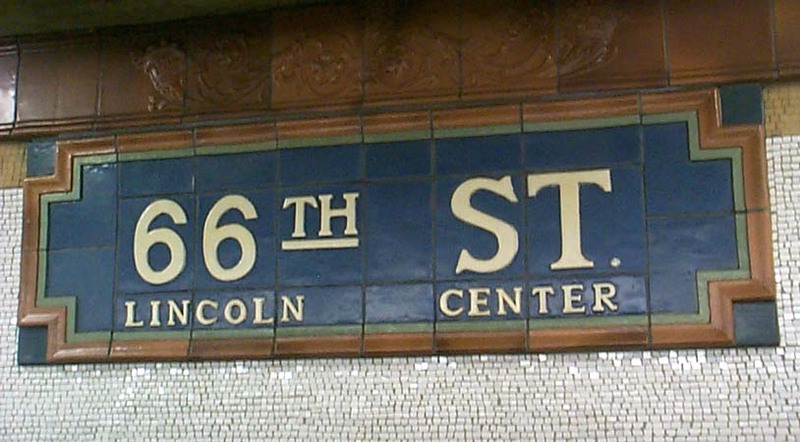 66 St has been beautifully restored, and the station name tablets could be mistaken for 1904 originals, save for one glaring detail: the new tablets read "66TH ST LINCOLN CENTER." 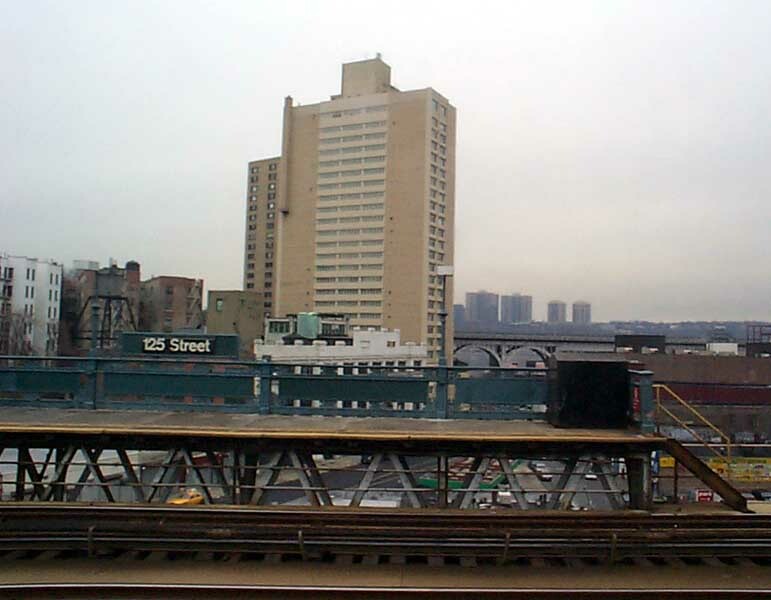 Lincoln Center opened in 1962. 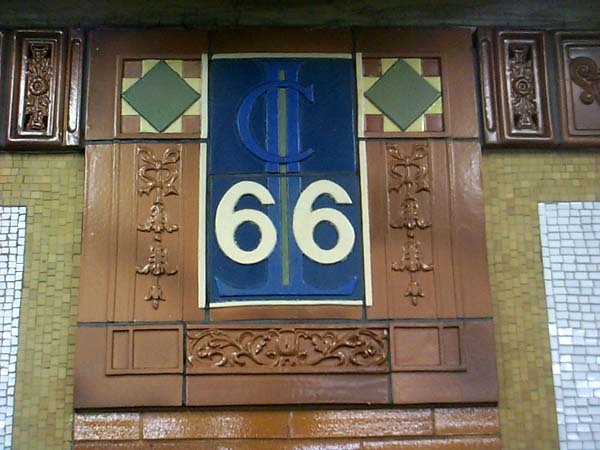 The new "66" number plaques feature a stylized "LC" in the background. 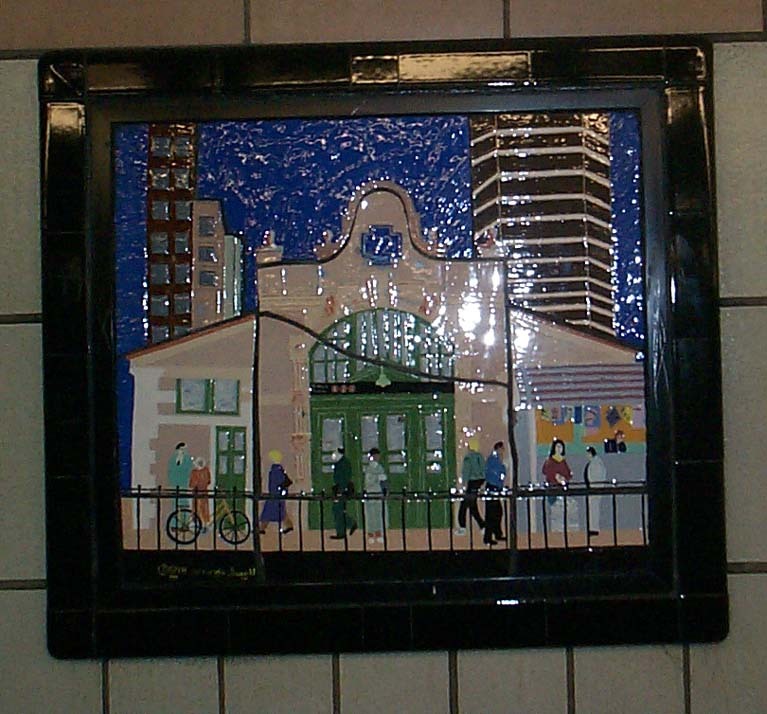 86 St retains its early 1960s look; however, small pieces of ceramic artwork, one of them depicting the 72 St stationhouse, have been installed. 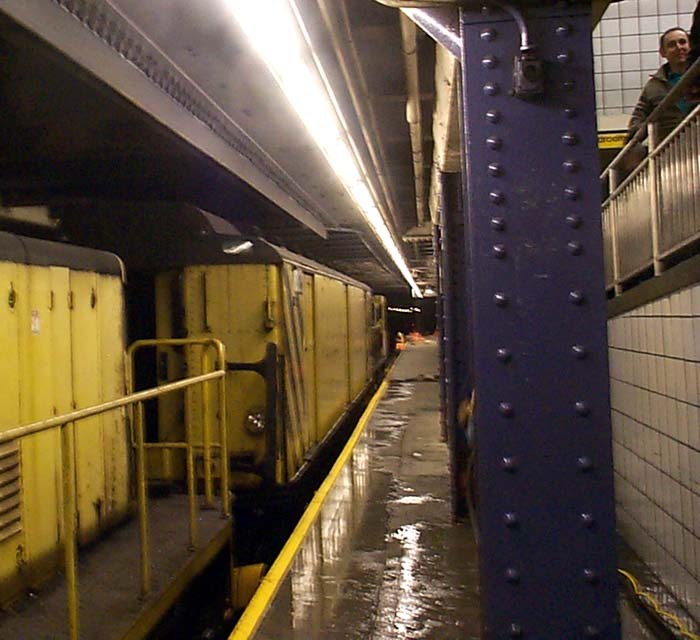 Next, we boarded an "upside-down 13" train to 96 St. Street entrances lead to disused side platforms; island platforms are accessed via crossunders. 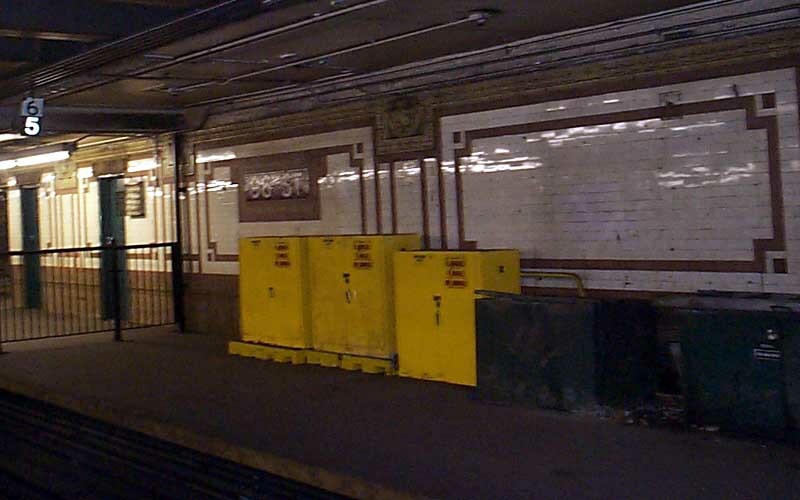 Iron fencing blocks off most of the northbound side platform, save for a passage to the restrooms, which are locked. 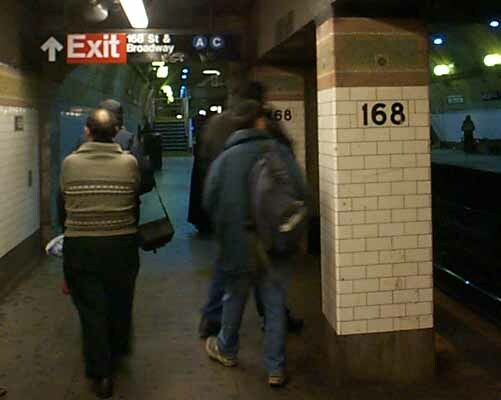 At 125 St, we emerged from underground... or rather, the ground dropped out from under us. 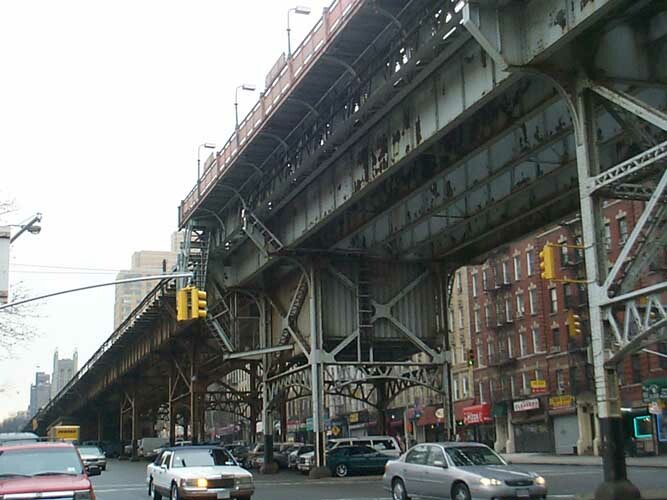 The line, supported by a cantilevered structure, remains relatively level while the surface of Manhattan drops down to approx. 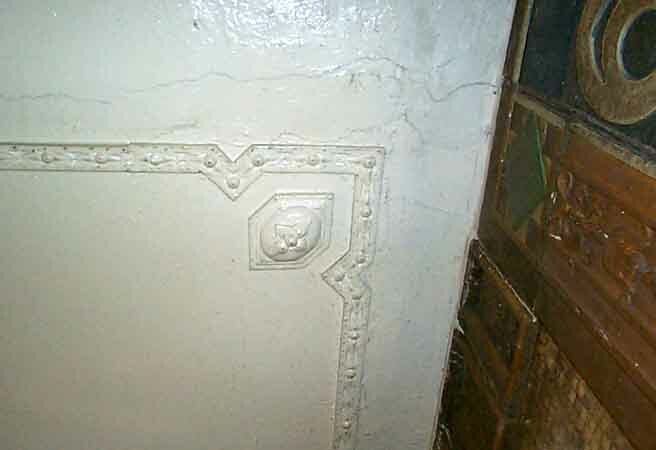 170' below it. 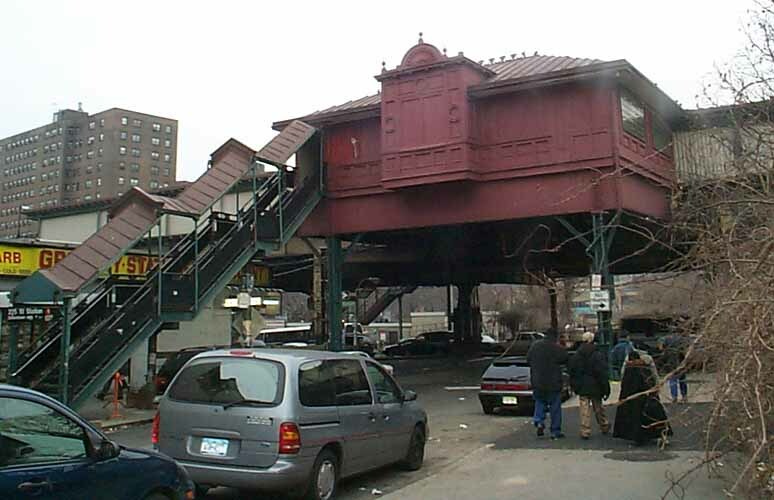 The station house retains its wooden floors, and the platform canopy is wood covered in metal, though the metal is missing in several places. 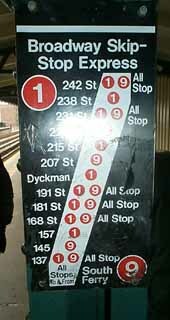 1/9 strip maps are still posted on the platform. 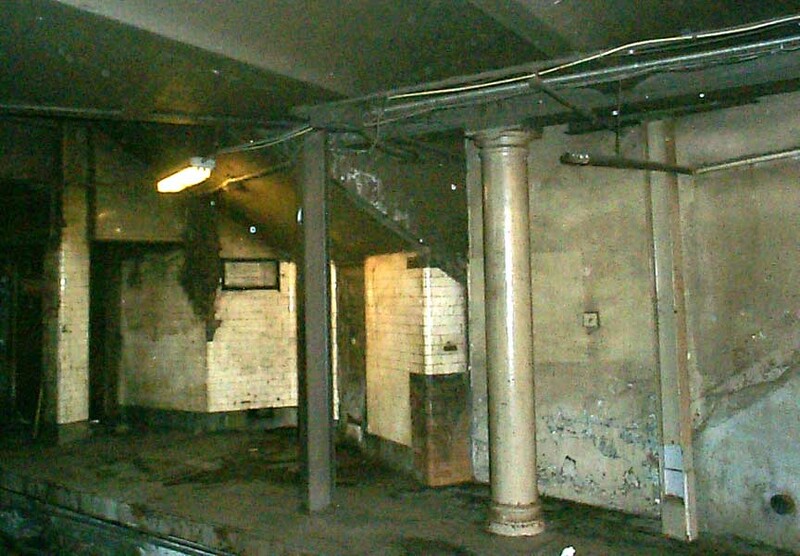 The group made a brief stop here to examine the structure from below, including evidence of closed portions of the station house. 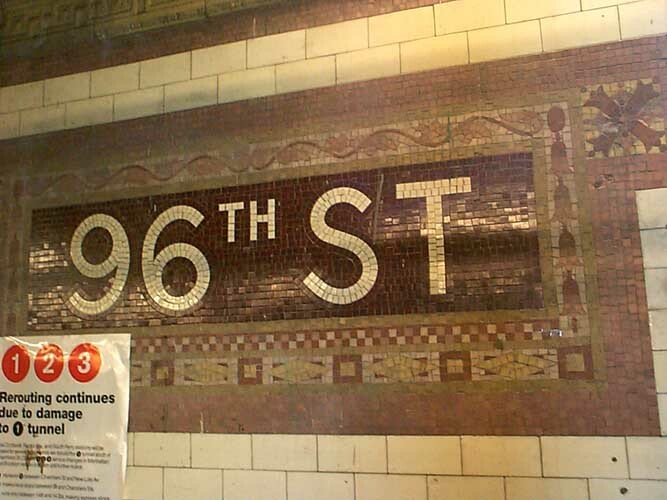 168 St, the next station visited on our tour, is, in my opinion, the grandest in the system. 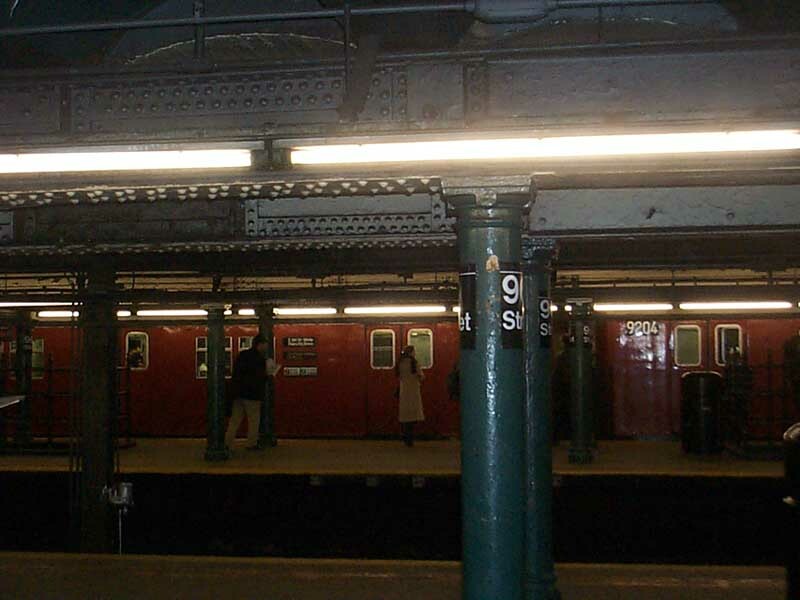 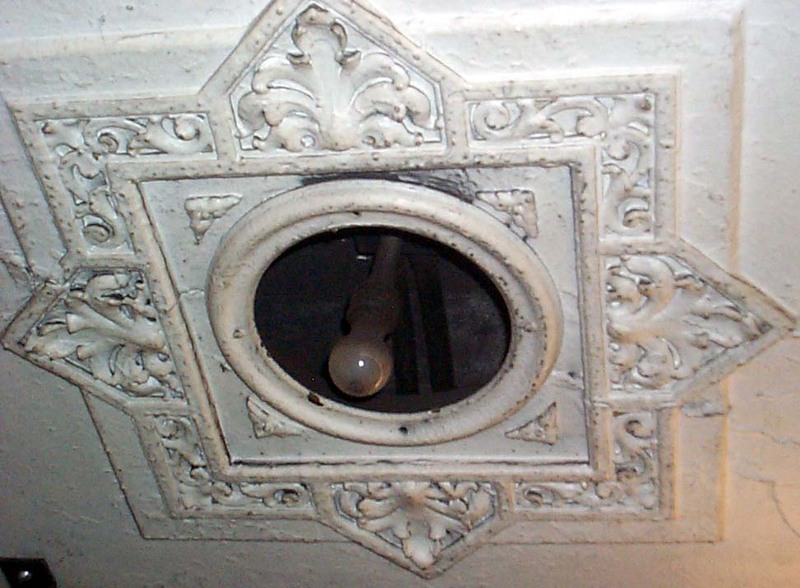 The platforms are still lit by ornamental mercury-vapor fixtures, and there is evidence of the chandeliers which once hung from the high-arched ceiling. 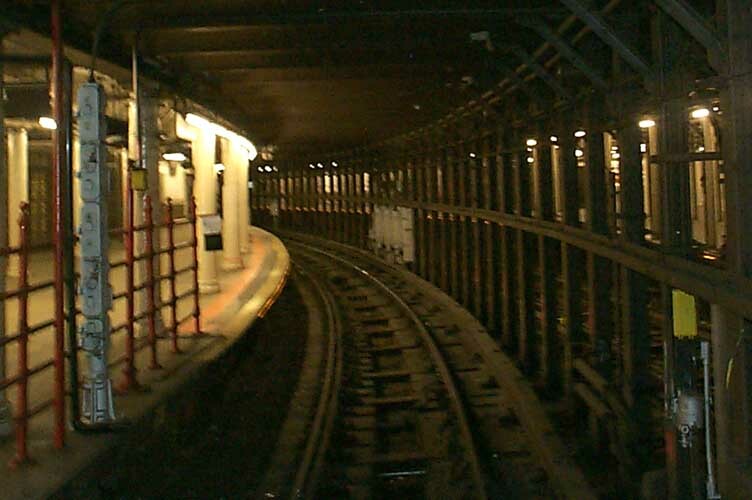 Platform extensions are made obvious by their IND-style tilework and change in the tunnel roof. 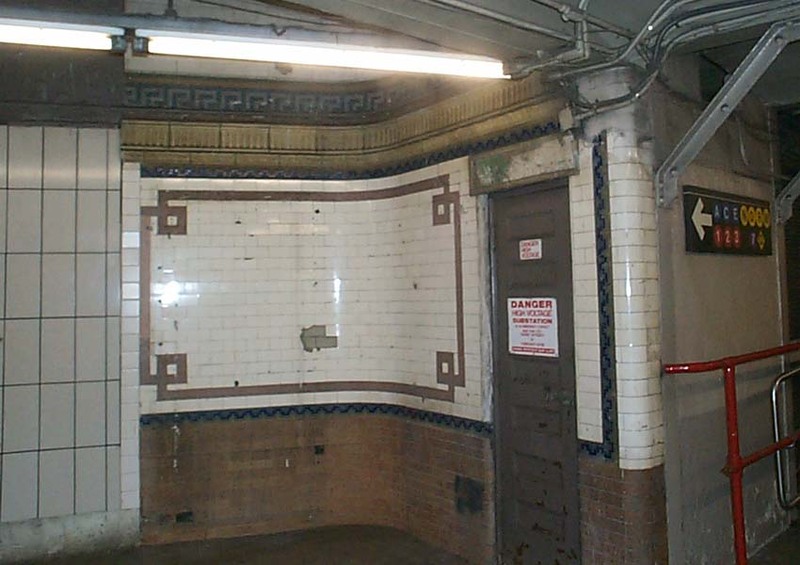 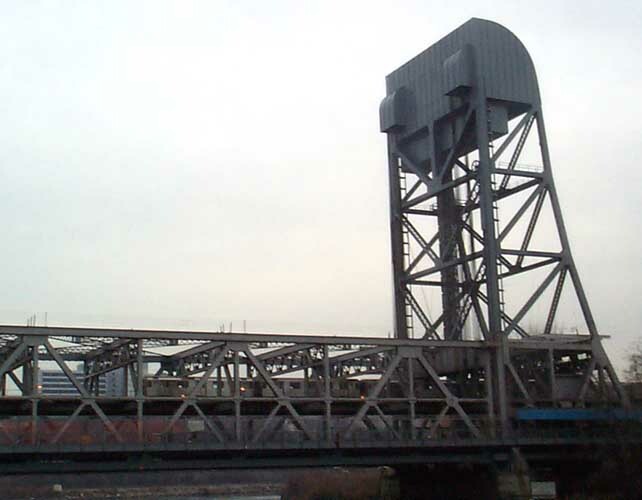 Double0decker elevators were once located at the east end of one crossover; the lower level has been walled and tiled over, and grillework is in place where the doors for the upper level were. 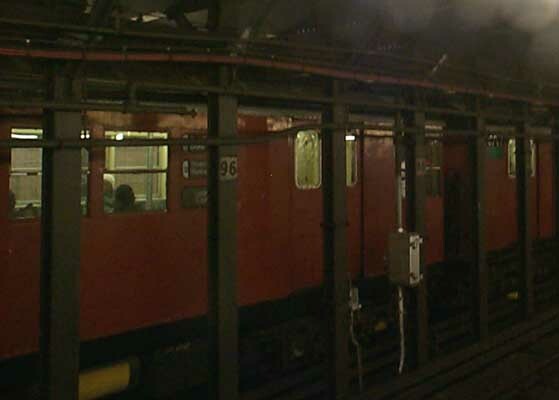 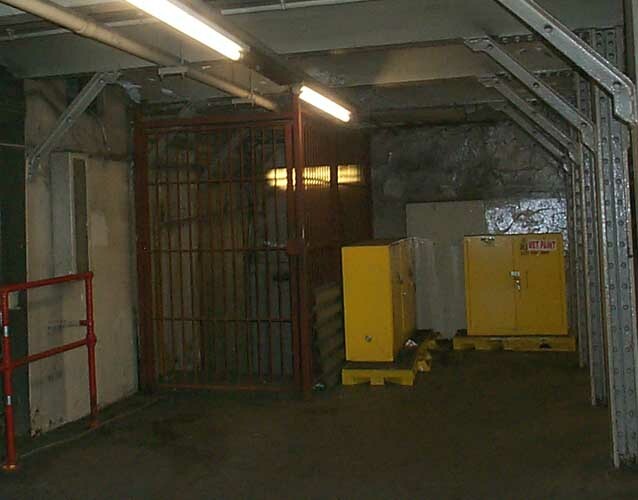 The shaft is now used for ventilation, the cars having been removed quite some time ago; however, several pigeons appeared to be waiting for a ride in the upper cab. 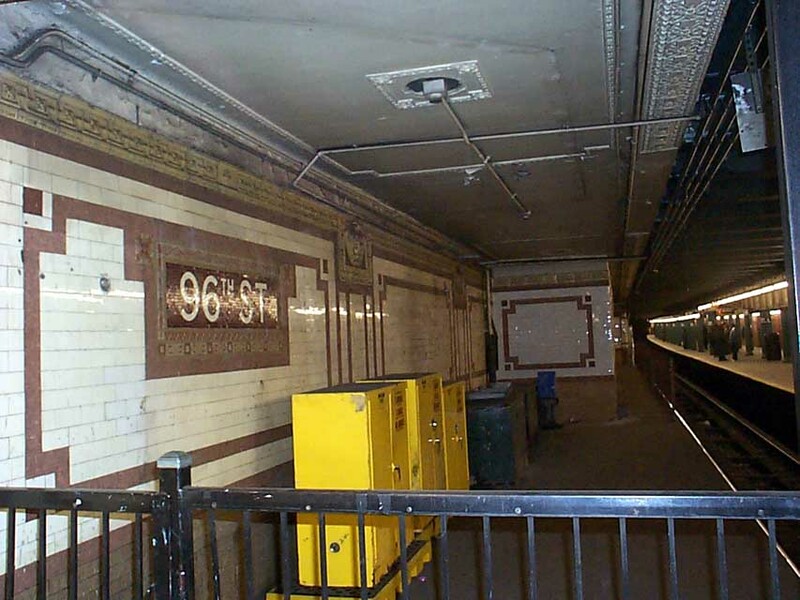 181 and 191 are similar to 168: high vaulted ceilings with flatter, IND-esque extensions and traces of long-vanished double-decker elevators. 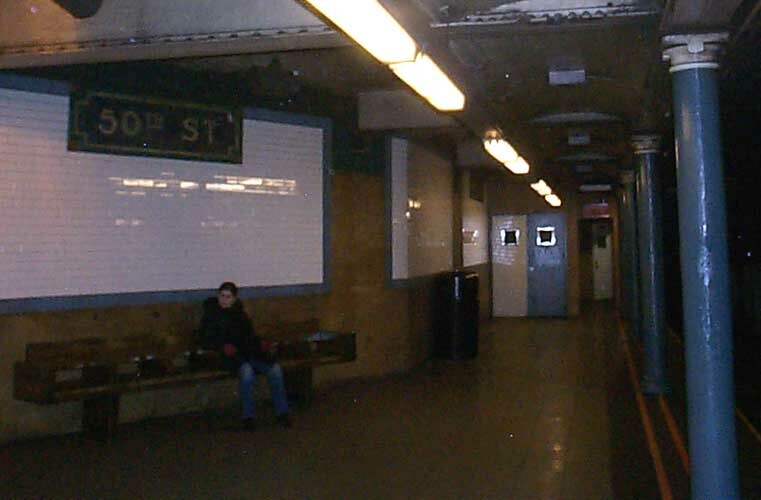 181 features a small shopping concourse outside fare control. 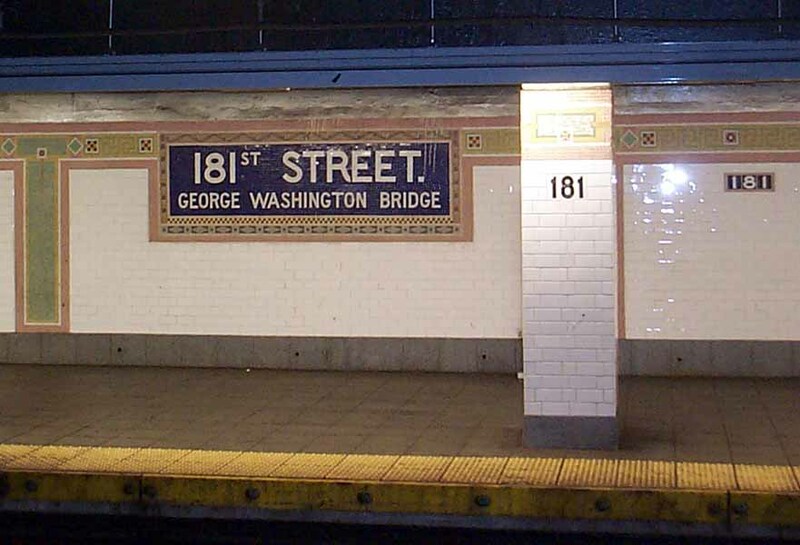 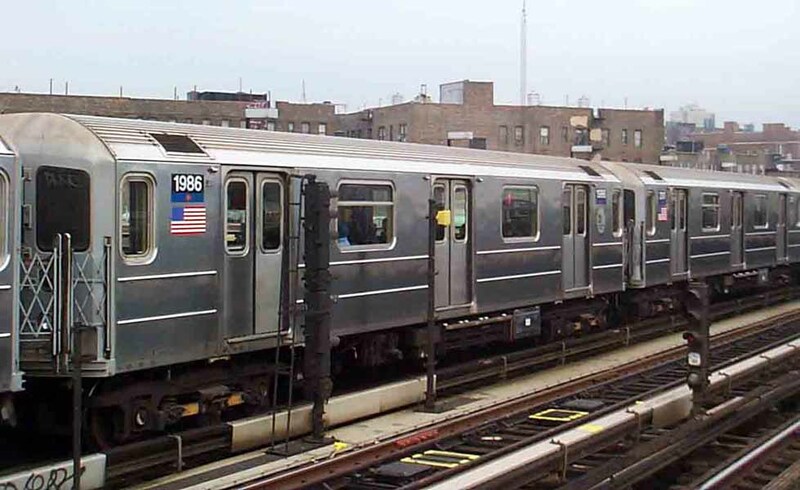 The IRT station name tablets are in two distinct styles; one has "GEORGE WASHINGTON BRIDGE" directly below "181ST STREET" in a blue field surrounded by a green border, while the other has "GEORGE WASHINGTON BRIDGE" below "181ST STREET" outside the border. 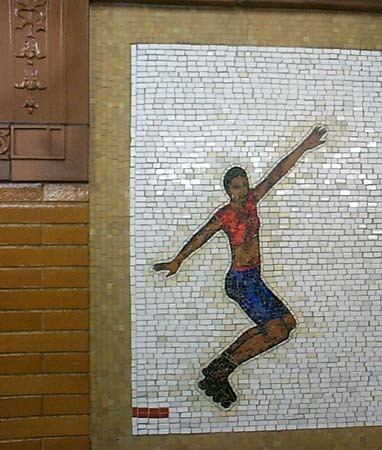 The two styles alternate along the platform wall. 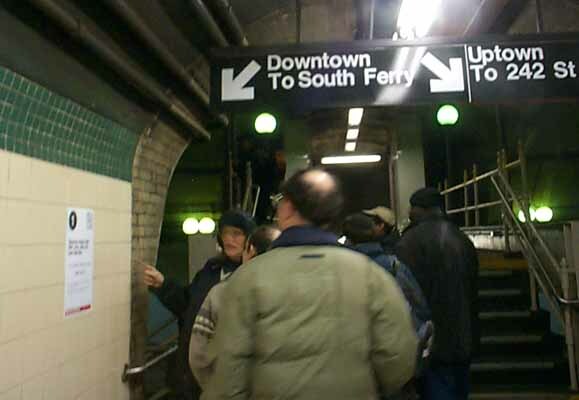 As we were about to leave the station, a "customer" ran down to the downtown platform, sprayed a 4' high tag on the underside of a staircase, and ran back up the stairs. 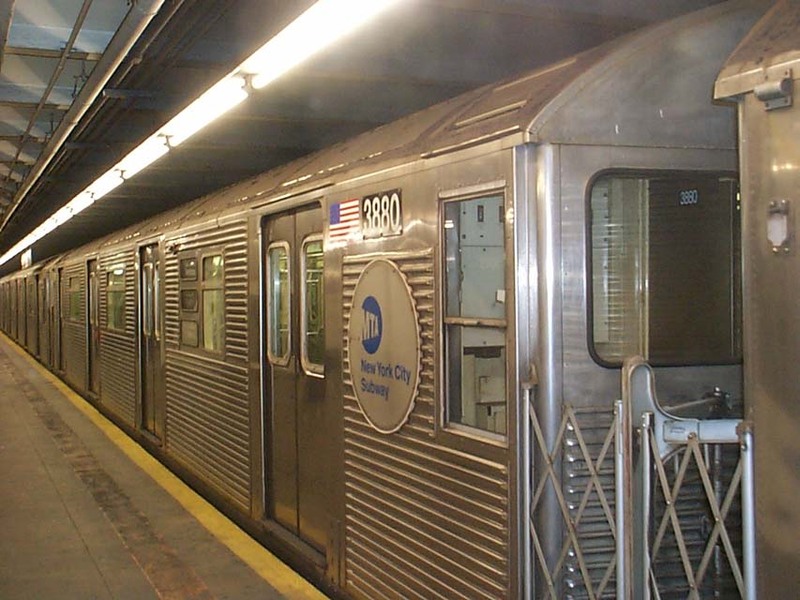 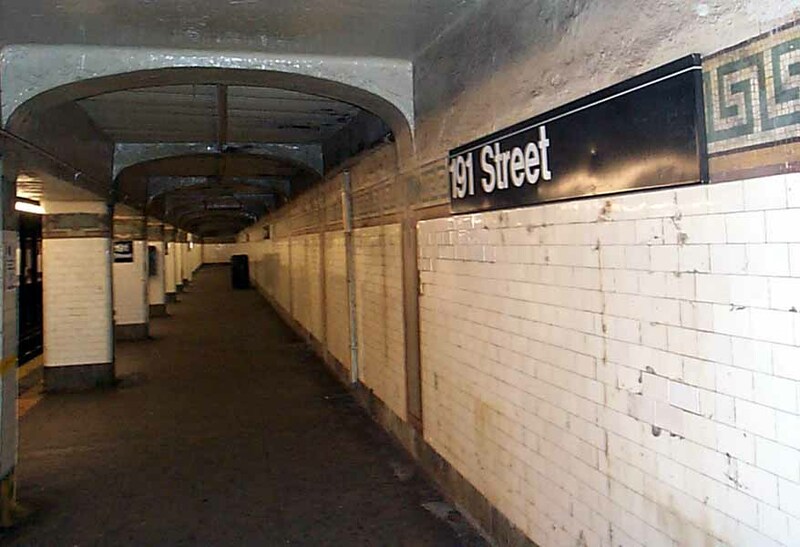 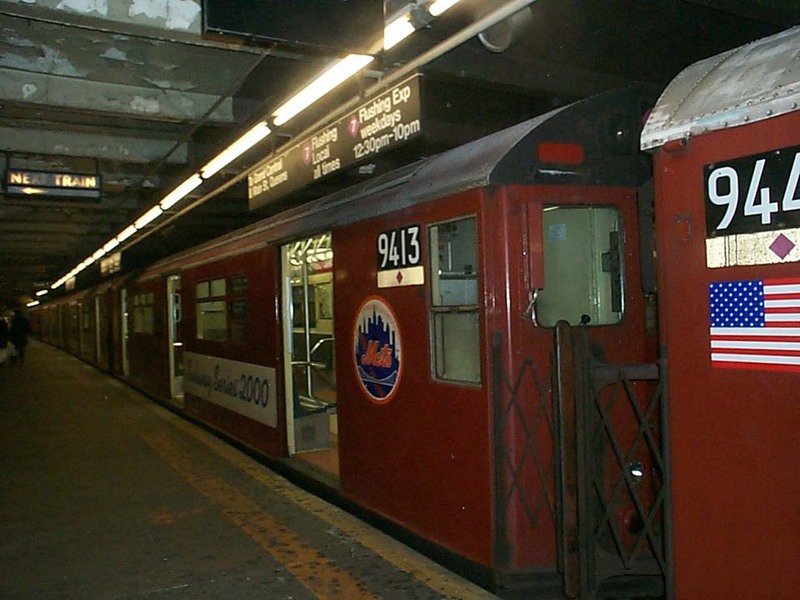 191 St, the deepest in the system, is in desperate need of renovation. 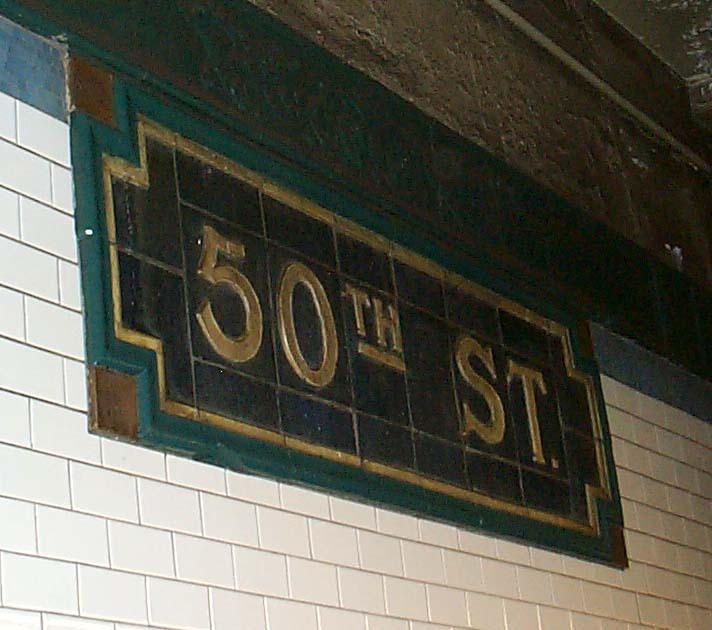 Most of the mosaic name tablets have been covered over with standard white-on-black signage. 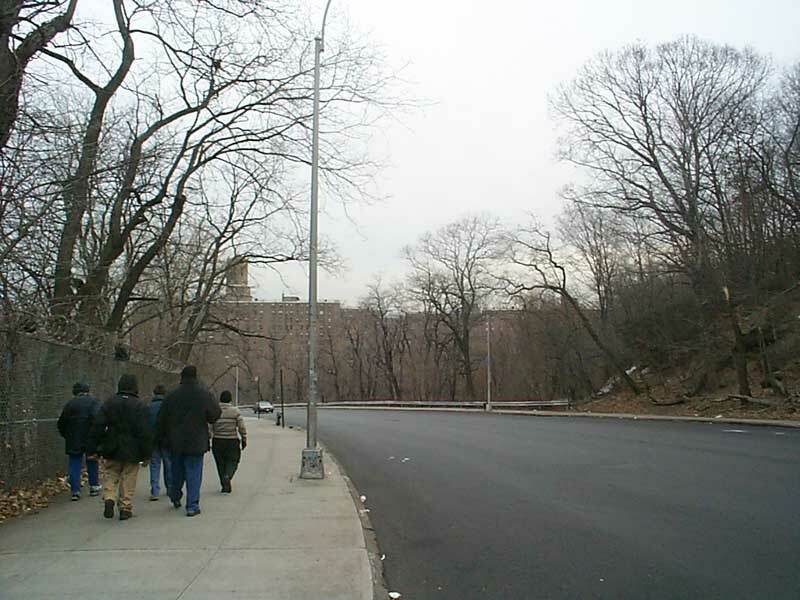 The group opted to get some fresh air and exercise and walk down Fort George Hill to Dyckman St. Attractions along the way included mission-style apartment houses on Wadsworth Avenue and a rather bucolic view of the side of the hill we were on not too long before. 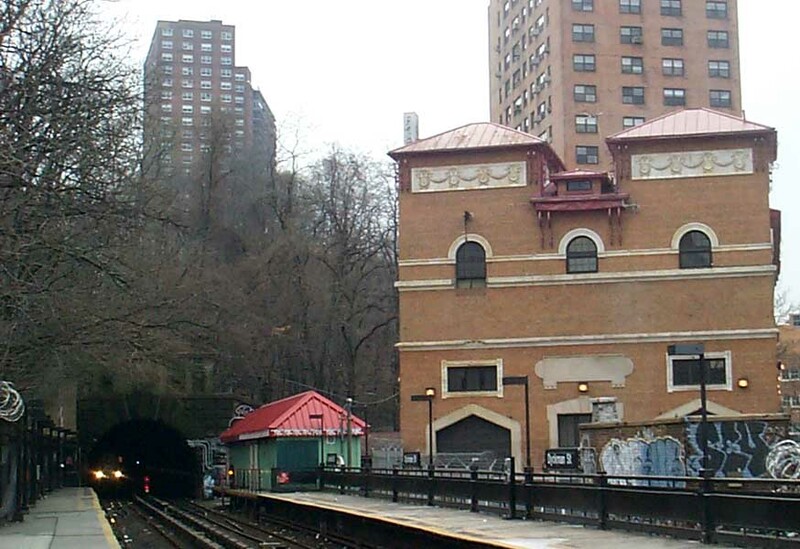 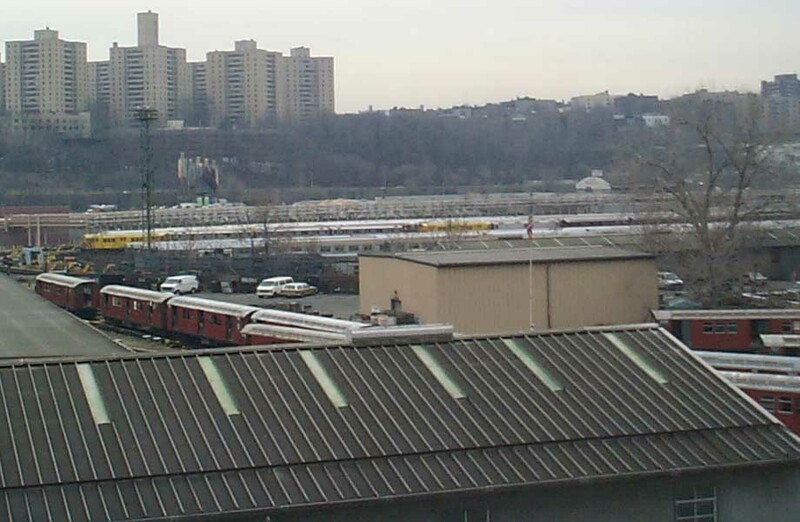 At Dyckman Street, the subway emerges from the hillside, and the station platforms are at grade. 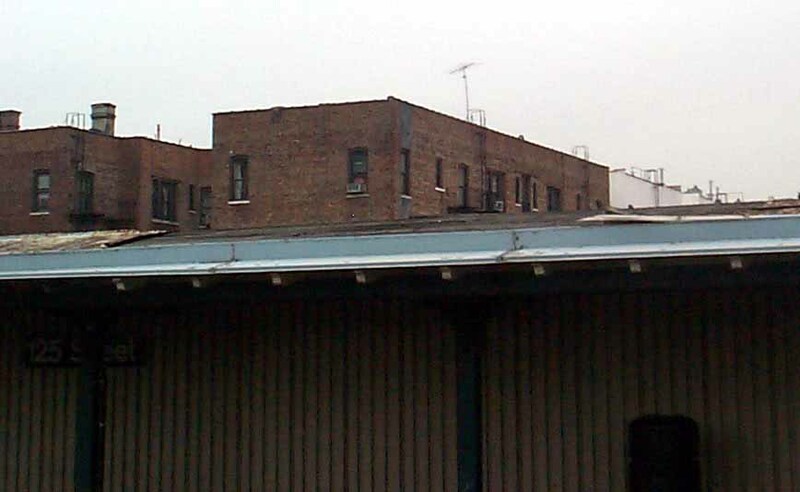 The Broadway el begins at the north end of this station. 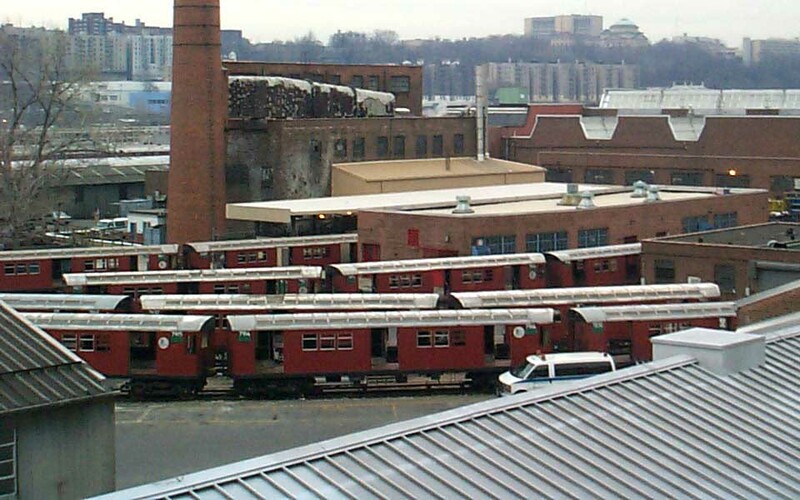 Our next stops were 207 and 215 Sts to glipmse reef-ready "Deadbirds" in the 207 St yard. 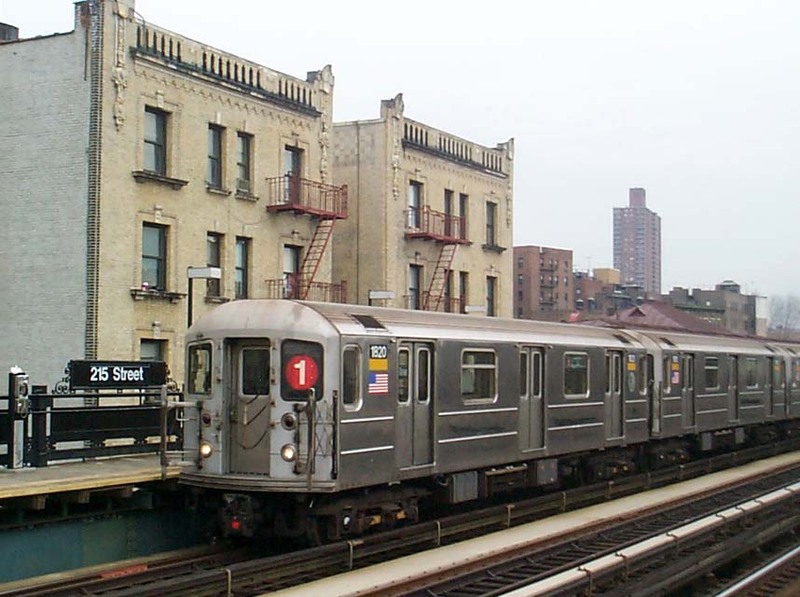 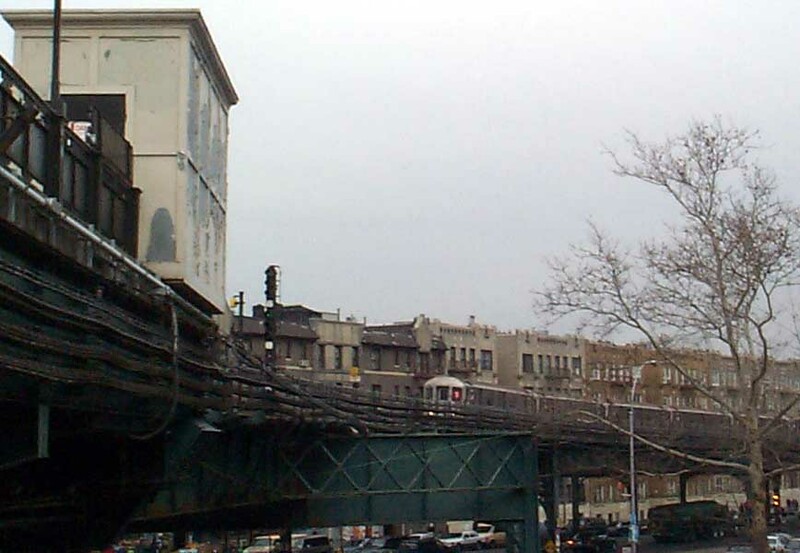 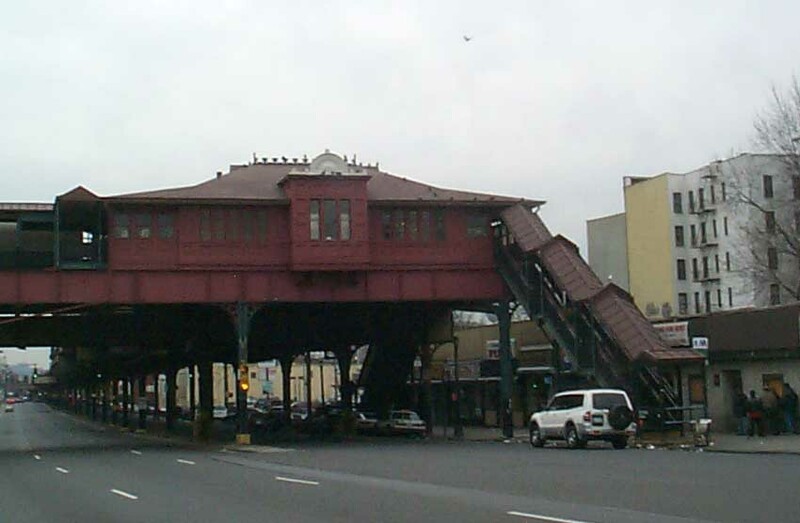 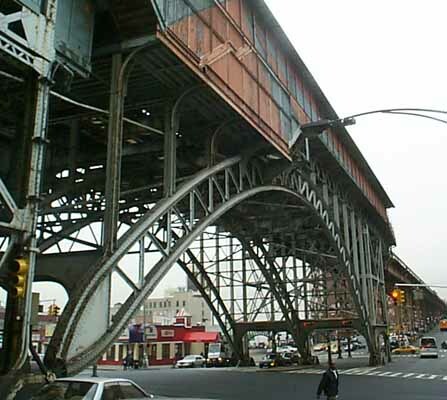 225 St, the first station north of the Broadway Bridge, was next to be explored, followed by a short walk to the Marble Hill Metro North station for views of the bridge. 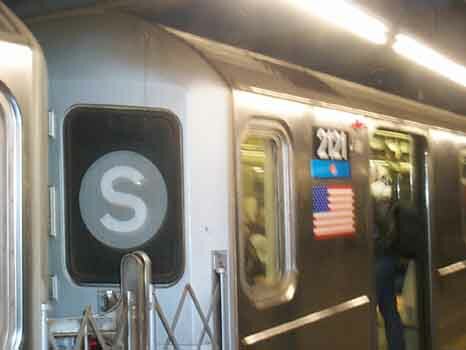 Last stop, 242 St. 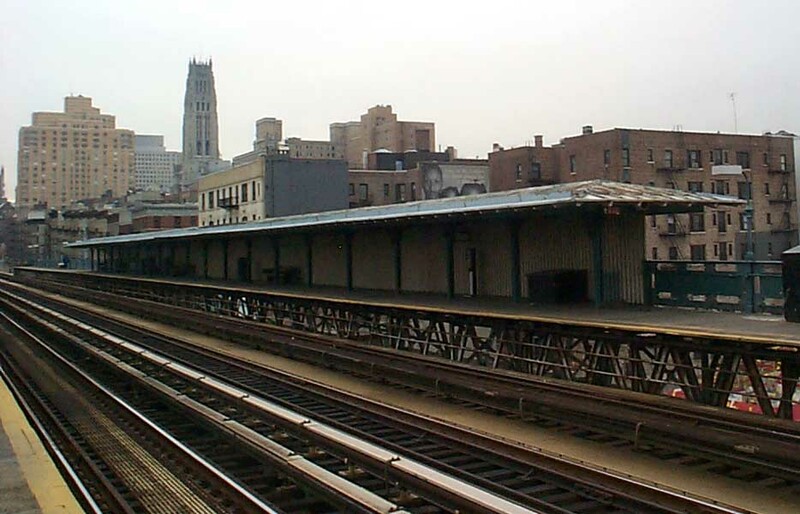 The terminal has two island platforms and two disused side platforms, which, oddly enough, are not blocked off. 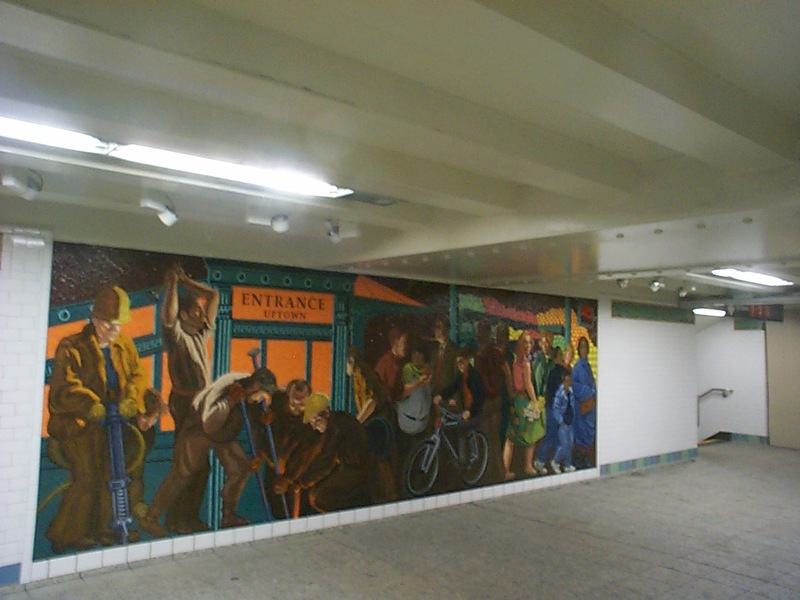 Broadway is ~150 feet wide at this point, and the el only covers the southbound lanes; a covered pedestrian walkway extends to the east side of the street. 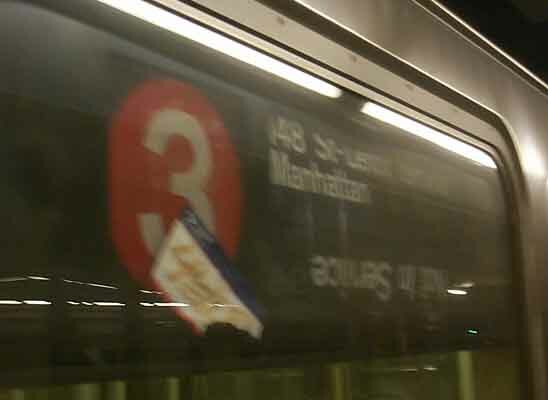 OK, so it's 1:48 P.M., you have an unlimited-ride Metrocard, a knowlegeable tour guide, and nothing in particular planned for the rest of the day. 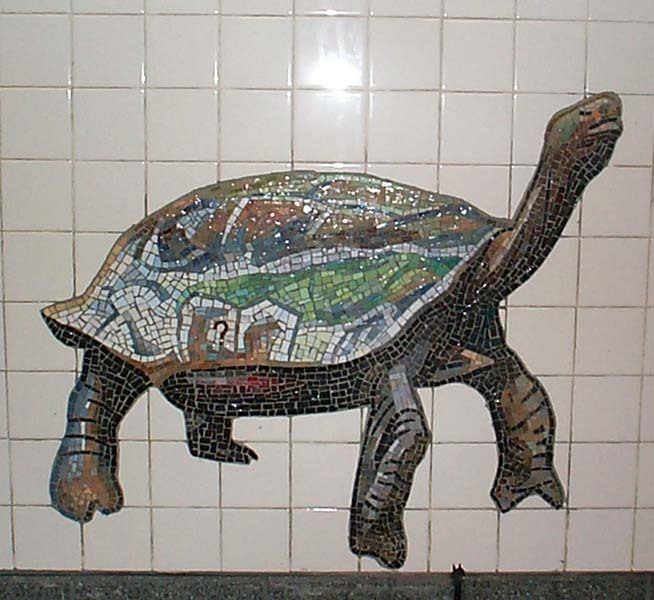 Naturally, the only logical thing to do is to keep riding! 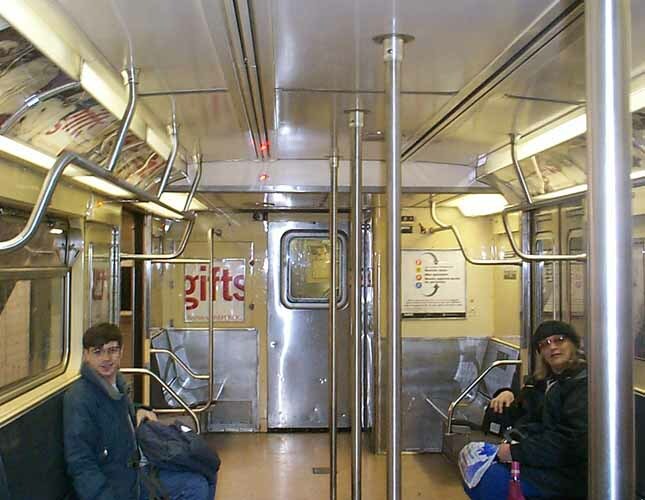 The Wengeroffs had already left Burger King, so it was down to a core group of five for the ride back on the 1. 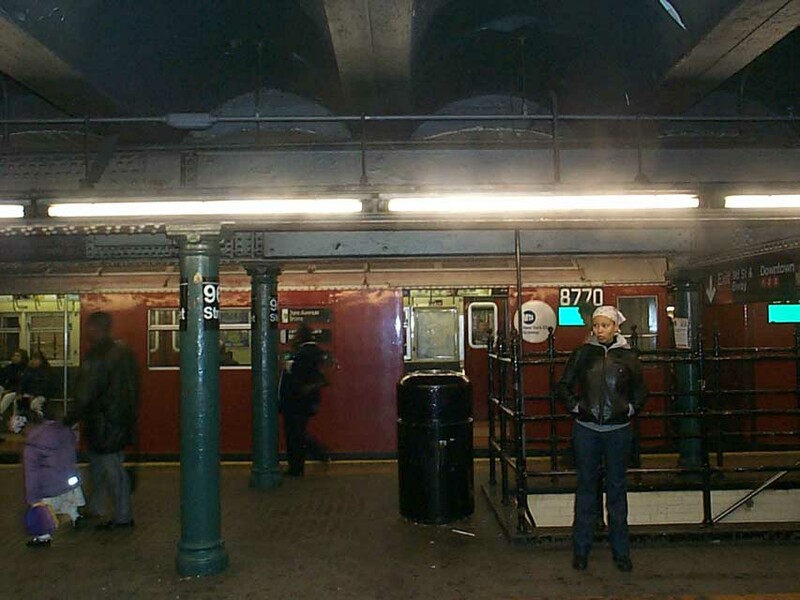 At 168 St, Interborough and his friend stayed on the 1, while Peggy, David, and I headed for the IND. 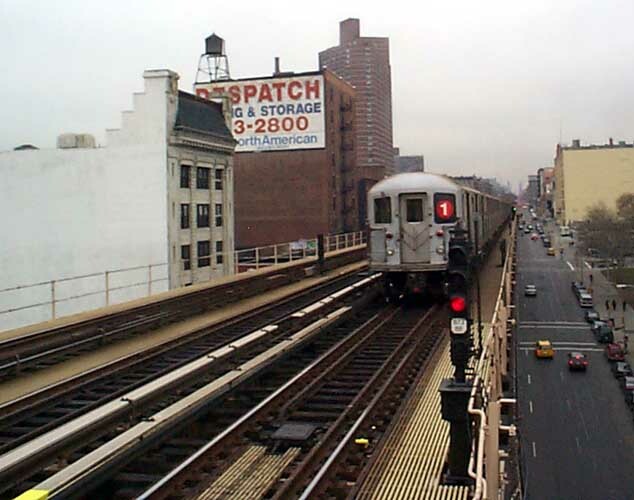 We caught an R-32 GE car (#3880-1) for our ride to 145 St, where Peggy showed us four sure ways to spot a staircase that has been removed. 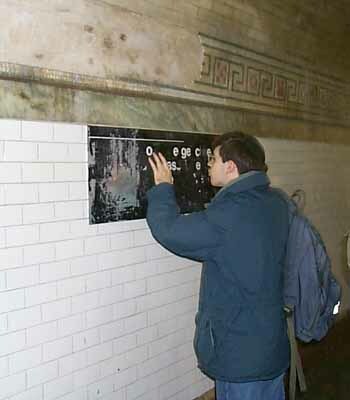 At 125 St, David and I were put to the challenge of finding the "ghost stairs" on our own :). 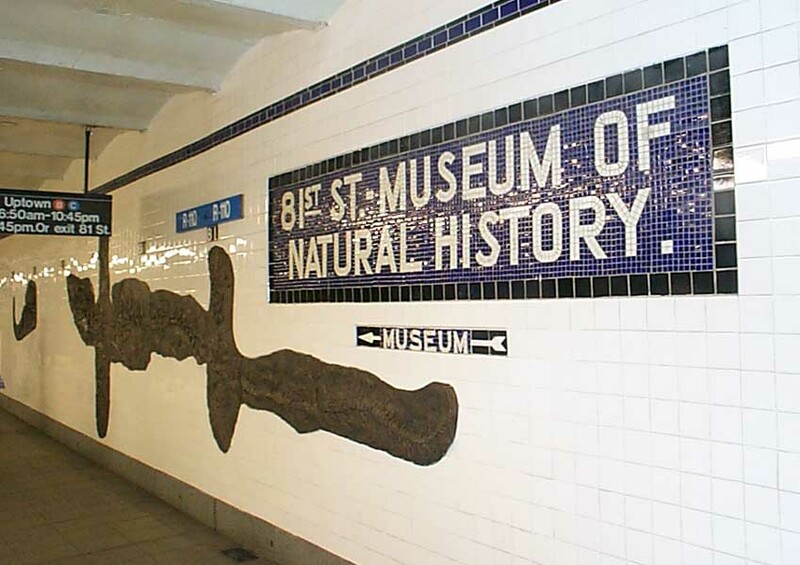 We spent a considerable amount of time exploring 81 St and its elaborate art installation, For Want of a Nail, a joint project between the MTA and the Museum of Natural History. 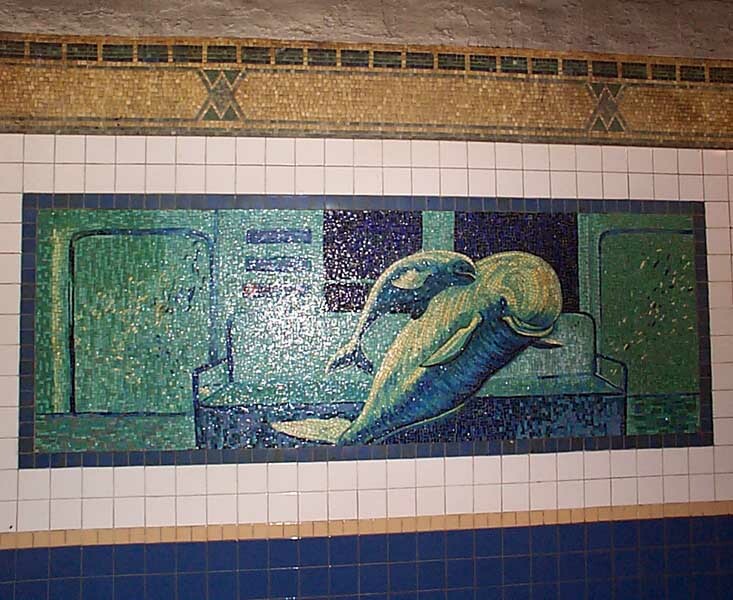 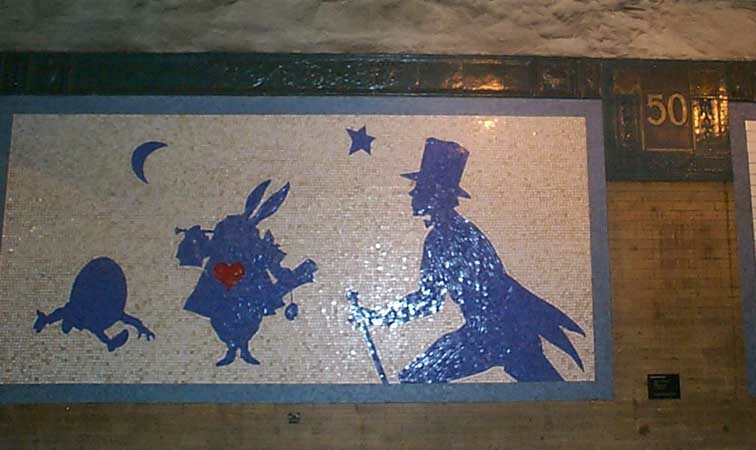 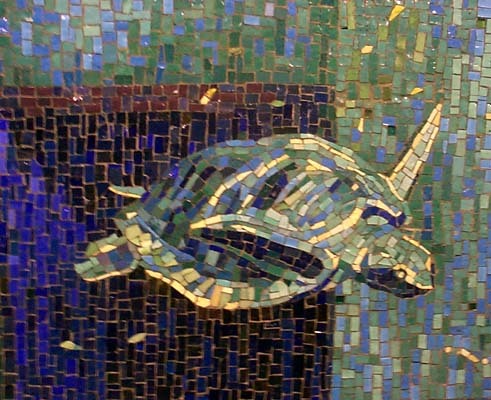 The platform walls feature reliefs of fossils, and there are small mosaics of brightly-colored present day animals that give way to grey silhouettes of their prehistoric ancestors. 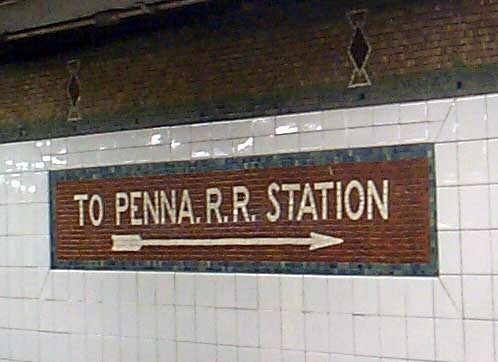 An animals whose ancestry is unknown sports a red question mark. 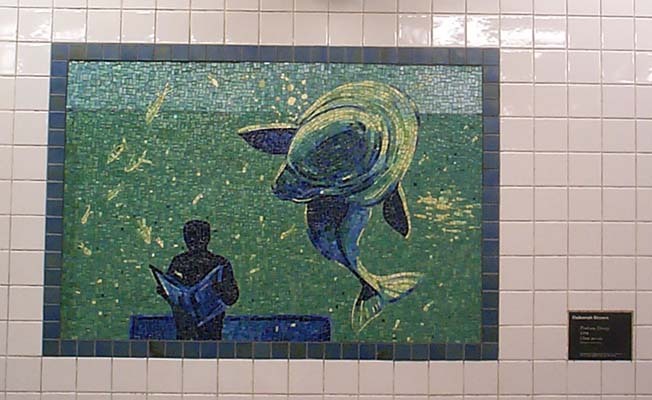 Floor-to-ceiling murals in the stairways depict marine life (a recurring theme, apparently; see Platform Diving at Houston St, the SUBmerged poster, and the fate of the carbon-steel IRT fleet) and a map of the stars, part of which is etched into a glass covering. 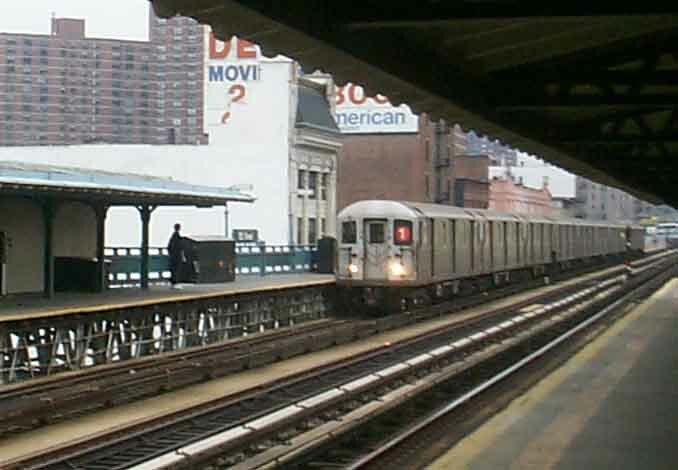 From 81 St, we hopped on a C train to get to the staple of SubTalk field trips, the Franklin Ave Shuttle. 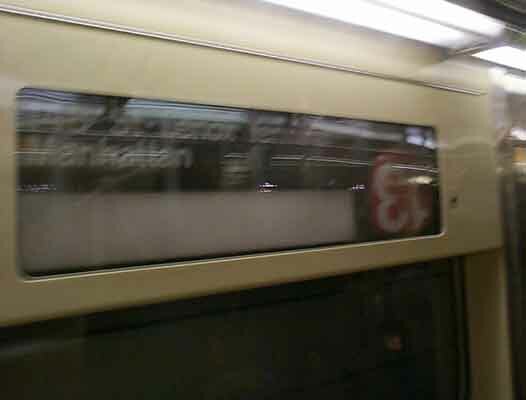 From there, we transferred to the 2 at Botanic Garden, on R-142 #6688! 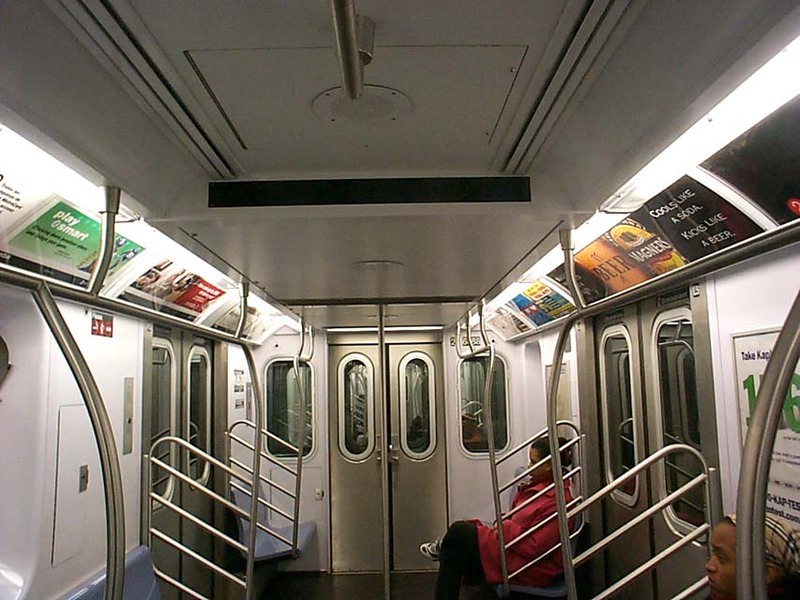 Side LCDs were off, and only the top left and bottom left LEDs on the interior signs were blinking. 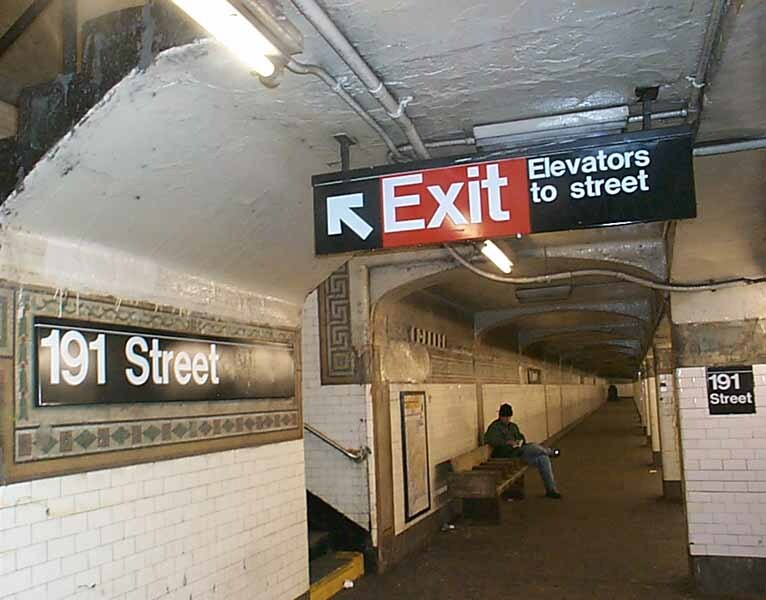 At one stop, instead of the doors going ding-dong before closing, it went, dong [pause] ding! 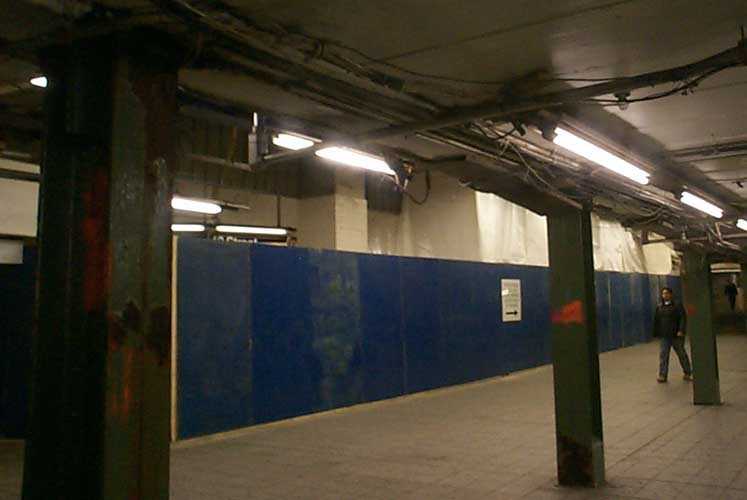 We got off at Nevins to see [a solid door leading to] the unused lower-level platform. 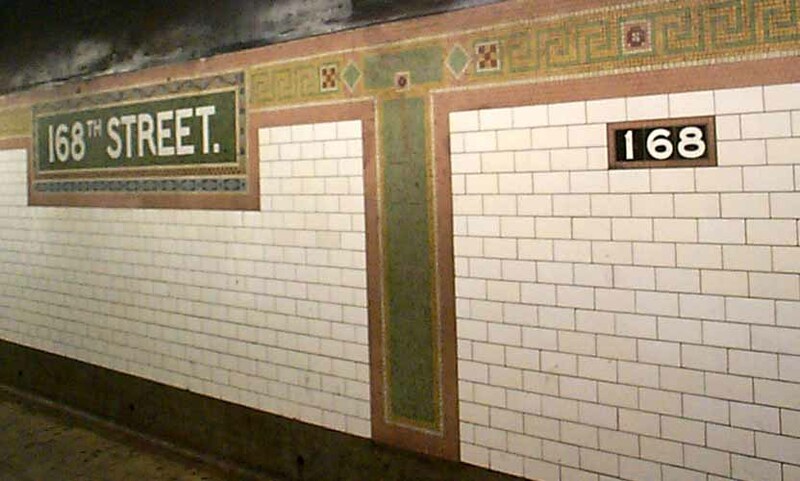 We also noticed, in addition to the column location (e.g., to paraphrase, "NEVINS ST SOUTH PLATFORM), "FULTON ST & FLATBUSH AVE" was cast into some of the columns. 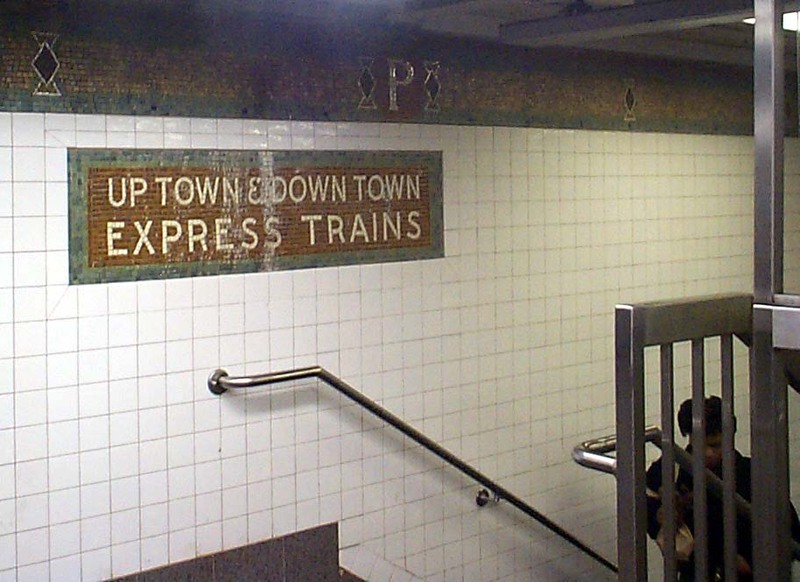 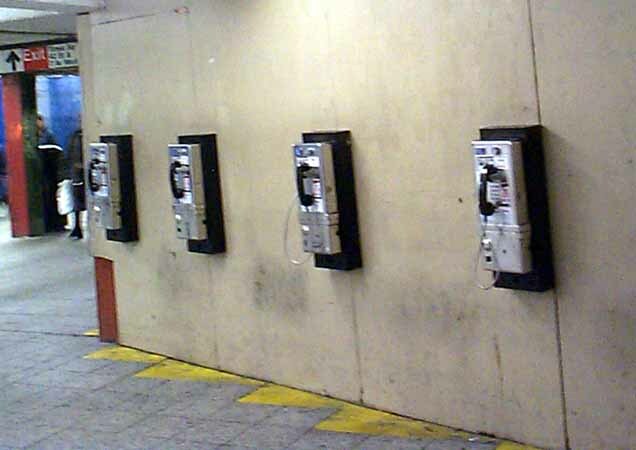 We took the next to, running express up the east side, to Bowling Green, where Peggy pointed out the Shuttle platform, now barricaded by a blue plywood wall because of asbestos abatement. 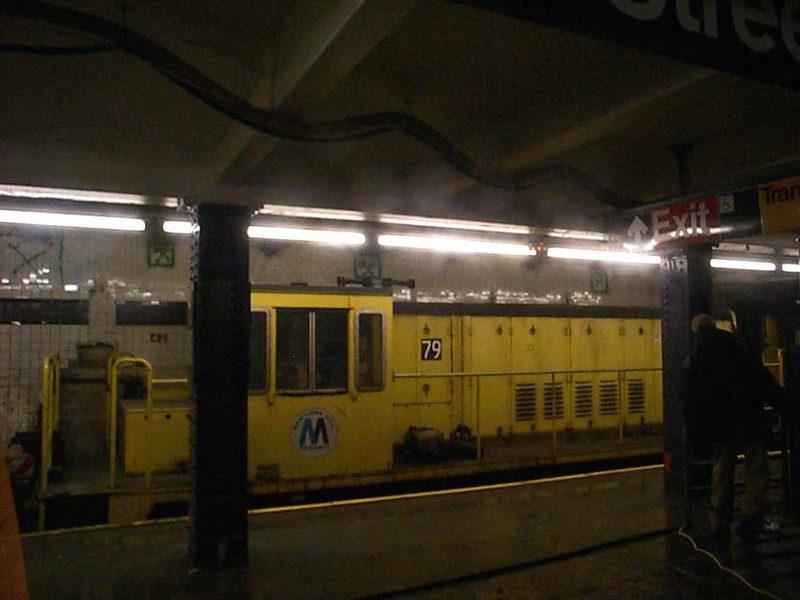 Thanks to congestion, the train dwelled in the station long enough for us to get off, tour, and get back on. 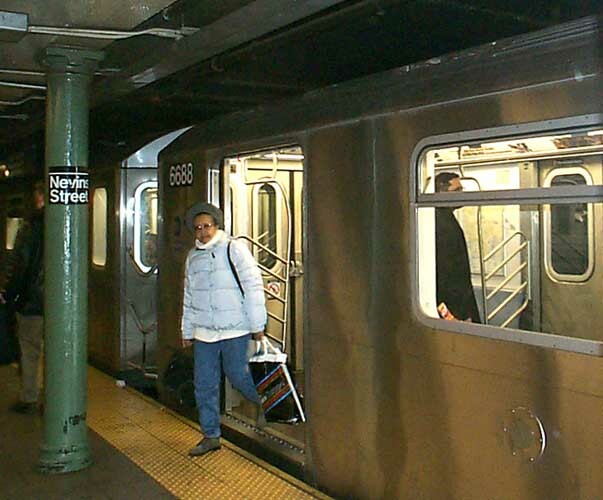 Peggy headed home at Grand Central, while David and I decided to continue up to the Bronx to catch another Redbird 5 express ride down the west side. 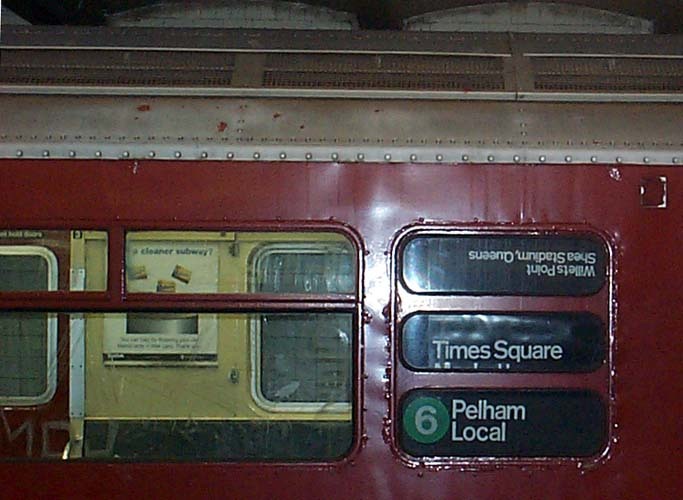 Another GO had the 4 replaced by a shuttle bus from 149 to 125. 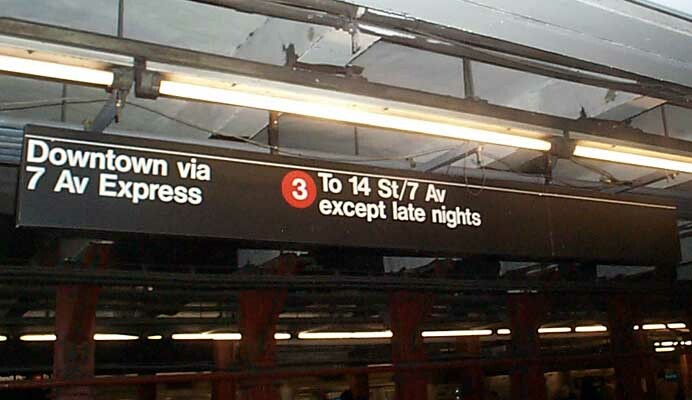 Naturally, before transferring to the 5, we checked out the downtown 4 platform to see how many people were waiting for a train that wasn't coming until 5:00 A.M. Monday; there were about a dozen. 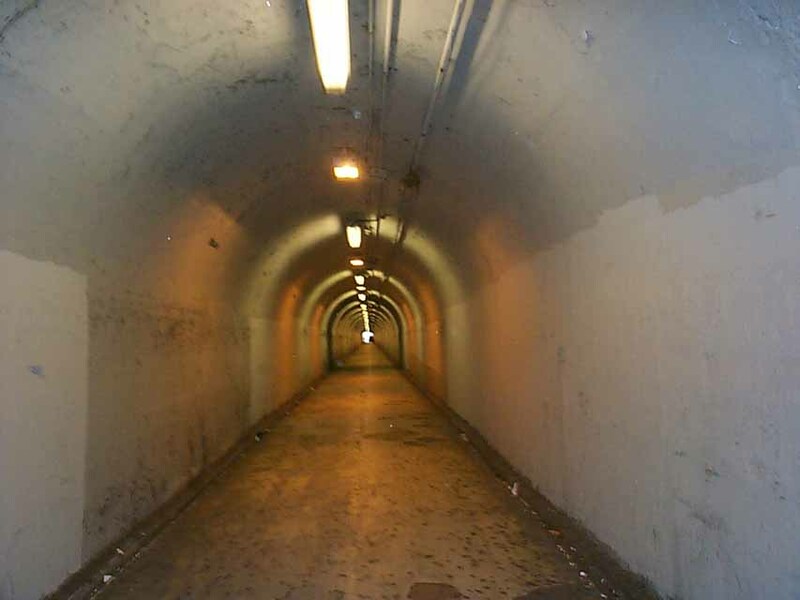 After nearly ten hours - more riding than I typically do in one week, let alone a day - it was time to go home. 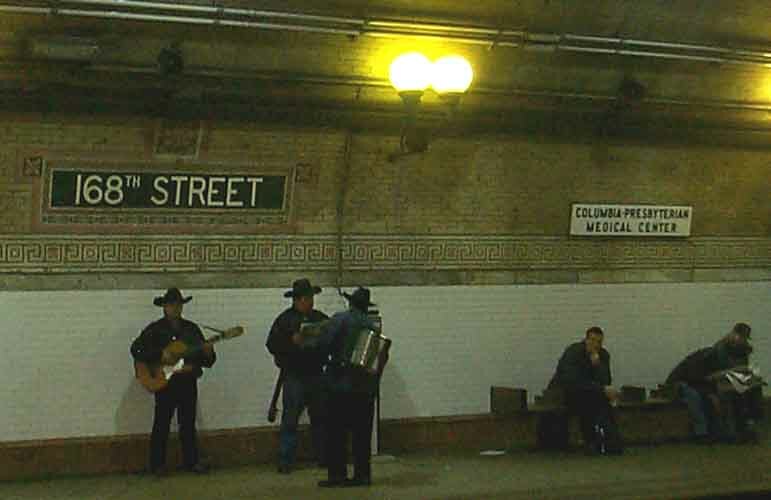 A huge thank you to Peggy for leading this trip; I had a great time and learned quite a bit.